Sometimes, and only sometimes, a piece of geek jewelry can rise above being tacky and decidedly unwearable to become tacky and borderline unwearable. Steve Wozniak's nixie tube watch is one such example. This ring with working microgears might be another. 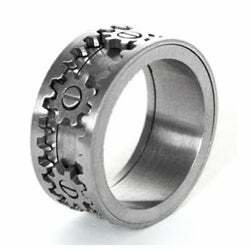 The Gear Ring, designed by Kinekt Design, is made of stainless steel and is, of course, quite ugly. But seeing the gears rotate as the ring's outer rim is spun is actually pretty cool. Is it enough to make me consider wearing a gear ring? No. Is it enough to make someone consider wearing the gear ring? Probably.